To the mother who did not nurse her baby, did not have a natural childbirth, or has not attained "perfect mother" status through any other means. You mothers are close to my heart. Why? Because you're just like me. Oh you may say, but you nursed your babies. You even had a nine pound baby without an epidural. You can't understand! And maybe I don't. But please hear me out before you say I don't know what you're talking about. I am the mom who didn't want babies. That's right! I didn't really want any at all. Or so I thought. Then God gave me the most gorgeous little baby you ever saw. And I was smitten, right? Well to tell the truth, it was a long road. Still is, this being a mother thing! I love my children with all my heart but I haven't attained perfection yet and I'm guessing any mother would echo that sentiment. We love our children - and how! - but oh my! 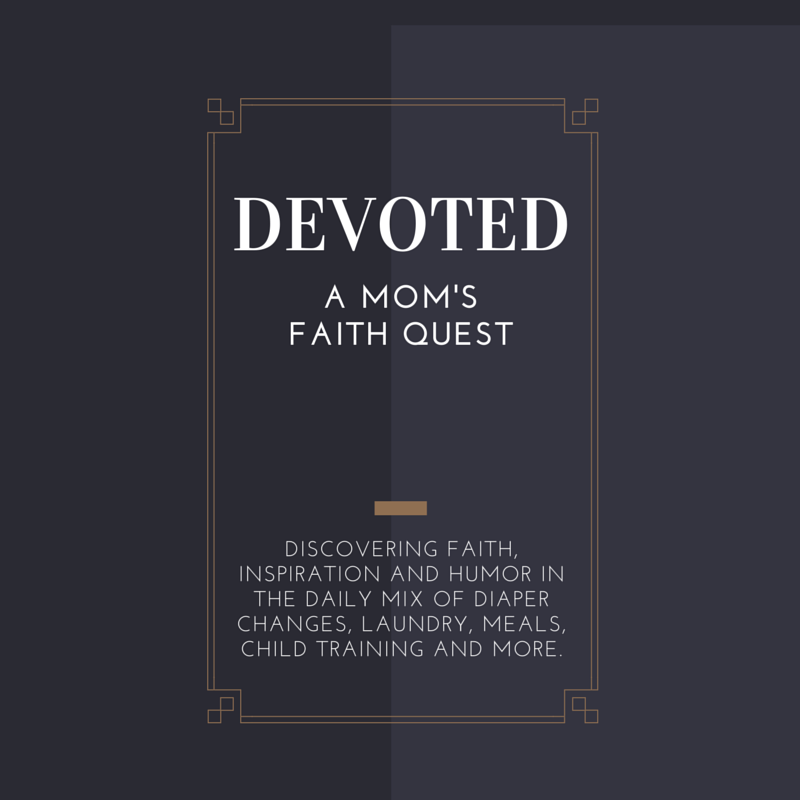 Who knew that in between the sheer wonder of mothering a little angel-sent-to-earth, there could be so many new questions and adjustments to face and that so many character flaws would be revealed in me, ones I didn't even know I had? And fearfulness must top that list for most of us. The niggling fear that whispers what if I'm just not doing this mothering thing quite right? What if I'm missing that one thing that will make my child popular or brilliant? What if, worse yet, I'm doing something that will seriously impact my child in a negative way for life? What if I am doing - or not doing - something that will harm them in some way, compromise their health, jeopardize their self-esteem, limit their faith? What if I, in fact, am less than a perfect mother for this absolutely beautiful, this perfect child God has entrusted to my care? There is good news for you, sweet mom who is doing her best. Of course there is bad news as well. The bad news is that while we are all aware that we are simply not perfect and never will be, we are still often tempted to push toward that elusive and humanly unattainable goal. The wonderful news is that through Jesus, we are, in fact, made perfect. This means that there is grace for our human weaknesses and mercy available to redeem our failings. This is such an amazing truth and I have been blessed by it many times as I remember God's unfailing mercy and forgiveness to me, a poor ignorant mother striving to raise the greatest little blessings I have ever known. 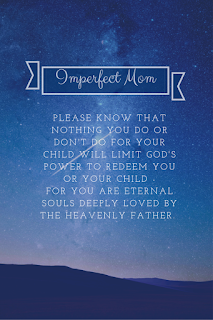 You must also know that God's "perfect mother" requirements are quite different than the world's. Do you think God cares as much whether or not you nurse your baby or whether you give birth through a fog of medication as He cares whether or not you will do your best to place your hand in His in simple faith and let Him guide you as you raise this child? He leads us gently one step at a time and perhaps your less than perfect experience can be a stepping stone for growth in your Christian faith. Grasp this knowledge tightly, dear mother and never let it go. 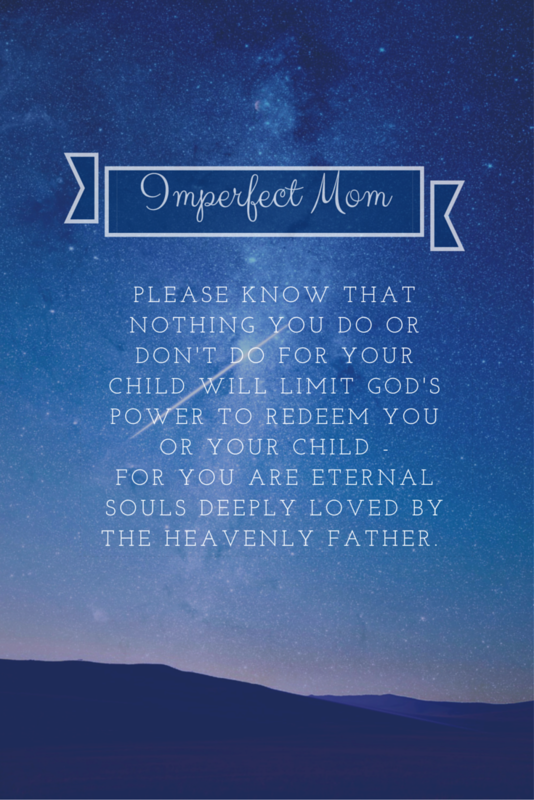 Please know that nothing you do or don't do for your child will limit God's power to redeem you or your child for you are eternal souls deeply loved by the Heavenly Father. Once you have established within yourself that God is a God of goodness and grace, fully able and ready to care for and protect your child even despite your failings, you are better able to offer yourself a measure of grace as well. Please be patient with yourself as you learn to mother your children. As the saying goes, motherhood is definitely on the job training. You wouldn't expect perfection from a rookie just learning the ropes of a new job, career or art such as cooking, teaching or painting and you should offer yourself the same patience and understanding which you give to others. Realize that in time your expertise will grow and your knowledge will expand. Each new baby is a new chance to try a better or healthier way of caring for them as you are able. Each new year is a new opportunity to give your child your best version of you. Each new day is a new chance to stop beating yourself up for the things you did or didn't do, whether through ignorance or simply because it wasn't feasible at the time. Each new moment is a new reason to forgive yourself and give it all to God, to trust in His unfailing wisdom and mercy.